“OMG! What a night! Again and again I saw theatergoers impulsively throw up their hands to clap but halting in mid-impulse, a little embarrassed to be applauding in the middle of a song or dialog. All around, whether child or adult, faces were rapt, mouths half-open with laughter and fascination. At the end we leapt to our feet, clapping and shouting until we got a memorable encore. And so it should be! Shek was possibly the best WOB performance ever. 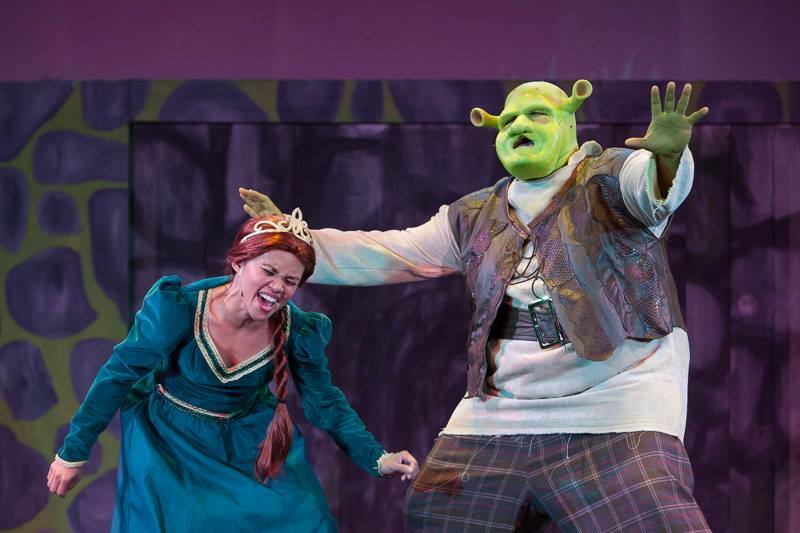 In 2013, Randy West waved his wand over the stage and made Shrek magic at the Sondheim. It takes vision and leadership at the top to bring all the parts together and make good theater happen. One of his best skills is knowing how to pick the right people to do the job, such as up-coming 30 year old NYC choreographer SIDNEY ERIK WRIGHT (keep your eye on this guy—he’s going places!). In many of WOB’s productions, West was choreographer with charming effect. But with two geniuses, the dancing in WOB’s Shrek “popped” with a dynamism, which, in Wright’s words, “married the storytelling with the music” and “evoked language with movement.” I totally agree. Even without words, we could have followed the storyline. It’s uncommon to talk about the choreography before the stars, but in Shrek, the management of so many characters on stage all at once, many of them children, calls for special kudos. How did they turn what surely was a nightmare of separate parts into the tightly knit dream that became the final production? As a group, WOB’s Shrek was surely the best performance to date in terms of synergy, meaning that all of the characters, the story, the music (thanks music director Chaz and accompanist Michael Gookin, a native Fairfielder), the dancing, the highly creative set (Evan Tyrone Martin and Ryan Gaffney), the rich and sometimes really funny multi-media (Robert Gottsall)—all the parts came together seamlessly and superbly. An extraordinary aspect of WOB plays is the multi-national, multi-color cast. It is a unique quality which few, if any, theatergoers get to experience. It brings to mind the saying, “The world is my family.” The effect is heart-warming but it also adds a richness of flavor, a groundbreaking largeness that I can’t put my finger on to describe.